There are reports that Boko Haram insurgents, who abducted about 50 women and girls from two border villages between Adamawa and Borno states have freed the women among their captives. This was disclosed in an interview by villagers, who spoke on the issue with newsmen on the telephone from their hide-outs. They however, said that the exact number of those released could not be ascertained, but that no fewer than 45 girls were still being detained. Mangoro which was between Gwoza in Borno and Madagali in Adamawa states. 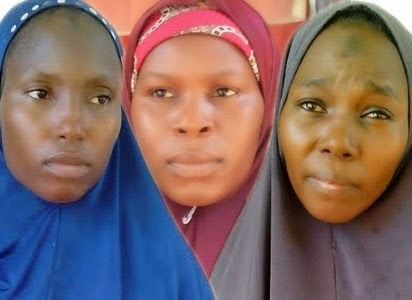 Relatives of some of the abducted women who were later released by the insurgents also, told newsmen in Yola that some of the girls have been turned to cooks while others were married off immediately to some of the insurgents. A relative to the one of the women who spoke on the condition of anonymity said; ”Initially, the insurgents captured 80 girls and women whom they later loaded into their vans and zoomed off into the bushes. Later in the night, the insurgents separated the elderly women from the girls and released the women, who are now languishing in the forest because they could not relocate the towns because they were razed down by the insurgents. “We are confused that hours after the so called cease fire agreement between the Federal Government and Boko Haram insurgents, our girls are still being abducted by the insurgents.